It was less than three weeks away from the big backpacking trip into the Mt. Thielsen wilderness, and there was an air of uncertainty over whether we would need to delay. Unlike previous years, however, it had nothing to do with threatening lightning storms or long-lingering snow. In stead, it all hinged on whether I could hike with a 30-lb backpack on a badly sprained ankle or not. I did not want to postpone the trip, so I made one of those “offer you can’t refuse” kinds of deals to a colleague of mine. Knowing that my colleague enjoyed the outdoors, I asked if he would be willing to carry my backpack—it was on a Sunday (his day off), and all he had to do was carry my backpack in for me, drop it off, and then hike out the same day if he so chose. 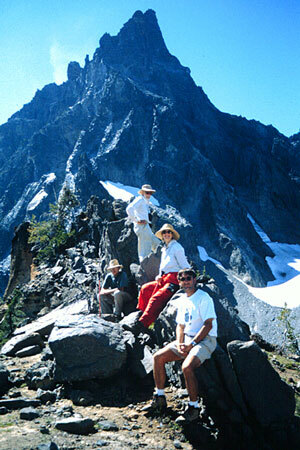 Before I knew it, I had a “Sherpa,” and I was set to meet my volunteers on the 1999 Mt. Thielsen Wilderness PIT project. With four very enthusiastic and ambitious volunteers, my Sherpa, and two dogs, we began our hike into the wilderness. We arrived at our camp five hours later, and my Sherpa was free to go, with no promise to return at the end of the week for the hike out. After setting up camp and feasting on gourmet freeze-dried dinners, we discussed the week’s activities. We knew that during the last Ice Age, which peaked approximately 21,000 years ago, extensive glaciers covered Mt. Thielsen and the Oregon Cascade Range. Then, approximately 10,000 years ago, the last Ice Age ended, and the climate of Oregon has since been, by comparison, relatively mild and stable. Nevertheless, widespread evidence still clearly indicates that during the last 10,000 years the climate has changed considerably: small mountain glaciers have repeatedly advanced and retreated, deserts have expanded and shrunk, and the distribution of vegetation has changed. How then did these past environmental changes affect cultures living during these changes? Did past climate affect hunting and gathering strategies in this area? The purpose of this project was to examine landforms, sediments, and other records contained in a large east-facing cirque on the eastern flank of Mt. Thielsen for evidence of recent climatic change and how it may have influenced human use of the area. After a week investigating the paleoenvironmental history of the cirque basin, we were able to develop the following chronological sequence of the events. A large moraine enclosing the cirque basin and covered by Mazama ash represented glaciation of the cirque before 6800 B.P. Several large, abandoned stream channels that had eroded into thick (5–10-m) Mazama ash mantling the cirque floor suggested wetter conditions in the past, with a water table about 5 m higher than at present. Protalus ramparts indicated former perennial snowbanks, and thus either colder or wetter conditions, during the Little Ice Age. Information from lichens (lichenometry) suggested a large rockfall from the east face of Mt. Thielsen within the last several hundred years. Several hundred downed trees, most lying parallel to one another, cover the northeast quadrant of the cirque basin floor. Two radiocarbon dates (210 ± 50 years B.P. [GX-26144] and 300 ± 40 years B.P. [GX-26145]) suggest that the trees died about 250 years ago. This study has helped us to better understand and interpret changes that we observe in the archaeological record of this region within the context of past climatic change. As always, it was a great week with great volunteers. The weather even cooperated, as did some of the mosquitoes. Though we had a brief rain shower one evening, we were rewarded with a double rainbow that loomed across the sky, framing the valley. On our last evening, as we chatted away under the bright, nearly full moon, thinking, Ah, what more could we have asked for, we heard a noise, perhaps a voice, and as the sound grew louder, from out of the dark emerged my Sherpa, with his dog and a pack full of goodies. Thank you all for a very productive and successful week.